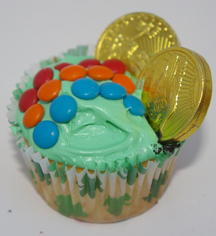 These easy St. Patrick’s Day cupcakes don’t require any special decorating tips or techniques, just mini M&Ms and some foil-wrapped chocolate coins. What You Need: 1 cupcake; white, green or blue icing; mini M&Ms in various rainbow colors; chocolate coins. How to Make It: Frost cupcake. Leaving a little space at the right edge for coins, arrange mini M&Ms in an arched rainbow. Add chocolate coins. This entry was posted on Tuesday, February 26th, 2008 at 4:00 am	and is filed under St. Patrick's Day cupcakes. You can follow any responses to this entry through the RSS 2.0 feed. Responses are currently closed, but you can trackback from your own site.